We Do Not REQUIRE Income Tax Docs for Your Loan Approval! Stated income loans are loans that do not require any verification of income. A stated income loan is perfect for self-employed and business owners who declared low income on their tax return. 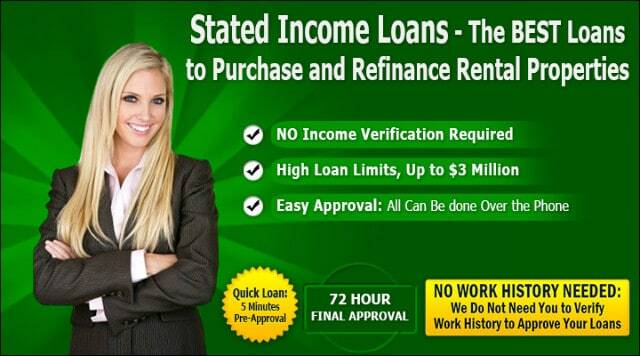 Our stated income loan agents are experienced in the loan industry and known for quick loan approvals and funding. Call (818) 987-2760 for your easy mortgage loan approval! Why Our Clients Apply for Stated Income Loans Instead of Other Loan Programs! Gift funds are accepted as part of the down payment. Up to 10% of the down payment can be borrowed from the seller or from a family member. Funded faster than verified loans since stated income loan have different underwriting guidelines and no income verification delays. Interest rates are about 7% – 9%, making monthly payments affordable. Borrow up to $2 million without having to provide tax returns and pay stubs. Approve for non-owner occupied properties. No income verification required! We do not need your income tax returns, your IRS form 4506t, your Business License, nor your CPA letter stating anything about borrower’s employment. The purchase or refinance property is non-owner occupied. Borrowers who cannot prove consistent income, or show a lot of income on their tax returns can now qualify for a stated loan and can borrow up to $2 million. Our Stated income loan agent will provide you a solution to qualify for a loan without the hassle of a long underwriting process and the headache and paperwork of income verification. For business owners or self-employed borrowers working with cash, stated income loans lenders make it much easier to qualify for a loan. All it takes is a good down payment to qualify for the home of your dreams. Call our mortgage loan agent today for a quick loan approval. We can get your loan pre-approved within 72 hours! Contact Us for Your 72 Hours Pre-Approval!